Decluttering kitchen counters is one of the most common reasons given for why people want to remodel. Contemporary design relies on clean simple design elements and a kitchen counter loaded with small appliances, spices and utensils doesn’t go so well with the contemporary style. But there are more than just design related reasons for getting rid of that countertop clutter. It can also be better for your health. Too many piles of stuff on your kitchen counters aren’t doing your physical or mental health any favors. Unopened mail, kids backpacks and lunch boxes, containers of randomness, bowls with keys and coins, and chargers for every household device can leave you feeling stressed out and tired. Scientific studies have shown that it can even negatively impact your decision-making skills and relationships. So how do you declutter? There are lots of great cabinets, organizers and design options to help but lets be honest… step one is probably to get rid of some stuff! We have a habit of collecting multiples of things like salt shaker, spatulas etc… as well as impulse buying the latest countertop appliance that we only use once a year. Start your decluttering process with a good hard look at what you could get rid of. If in doubt about an item just remove from the kitchen and put is in a closet somewhere. If you don’t miss after 6 months then you don’t need it! 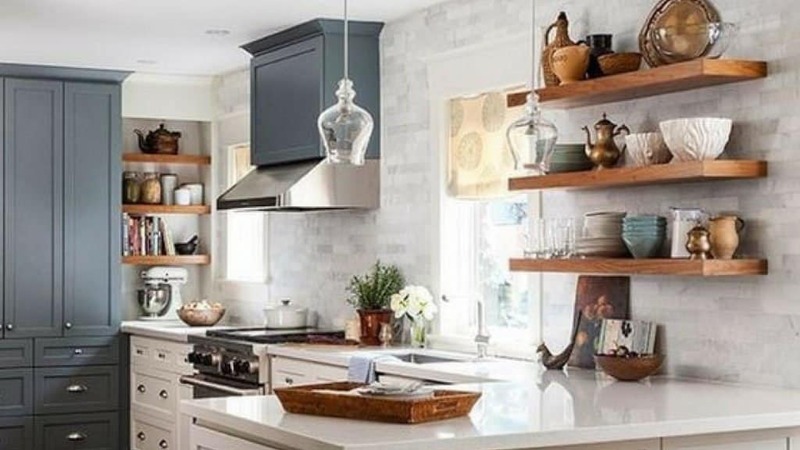 While kitchen countertops may be one of the toughest places in your house to keep clean (especially the island or peninsula ones), these 10 tips can help you bring some order to chaos. 1. Do an inventory. It’s the quickest way to get things started. Go through everything that’s now on the countertops and decide what absolutely must stay in the kitchen, what belongs in another room, and what can get tossed. When you’re done, you’ll probably be half-way through the process! 2. Use vertical space. Move calendars, to-do lists, and a mail holder to a wall or inside a cabinet. Hang a multi-pocket divider on the inside of a pantry door and assign each pocket to a person or task. 3. Group things together. 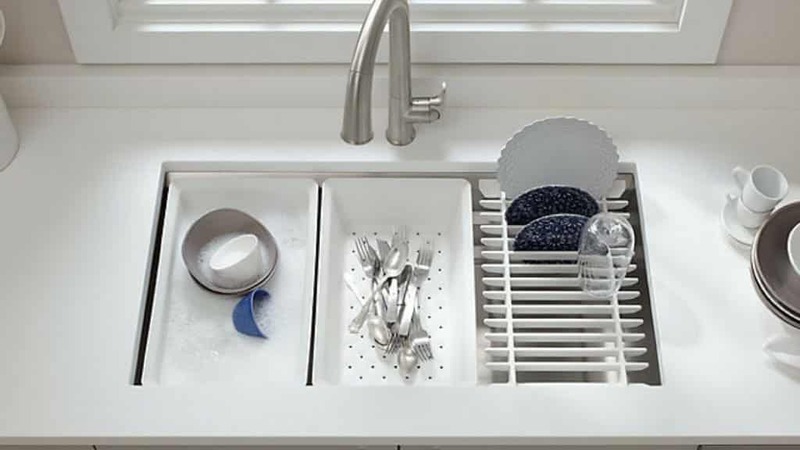 Whether you use a decorative countertop container or a designated drawer, frequently used cooking utensils should all be in one place. 4. Hang it up. 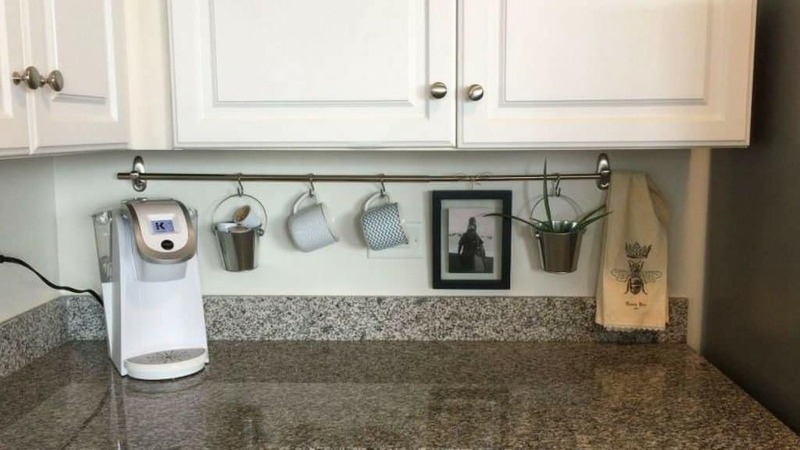 If you like having things like measuring cups and spoons, your favorite coffee mug, or even pots and pans always at hand, hang them from a towel bar, a pot rack, or underneath tall shelves. 5. Designate a tech spot. Choose one drawer or use an attractive basket that’s reserved solely for phones, chargers, and other tech-related devices and accessories. 6. Don’t replace clutter with clutter. Too many containers or baskets on the counter can just as easily overwhelm. Use the lower shelf of one cabinet or a designated drawer to store them. 7. Add open shelving. It’s a simple and efficient way to keep things close by. Shelves are also the perfect spot for storing cookbooks and recipe file boxes. 8. Stow appliances. Unless you have the room for it, an appliance garage can take up quite a bit of useable counter-space. Consider a pull-out drawer or corner cabinet with outlets that’s let you keep mixers, blenders, and juices out of sight until they’re needed. You can also move the microwave into the island. 9. Put your sink to work. Today’s sinks are designed to make life a whole lot easier. Many come with accessories like drying racks and cutting boards that you can pop in and out as needed. 10. Head to the island. If your kitchen upgrade includes a new island, choose one with some open storage. Already have an island? Consider adding a smaller, narrower piece against a wall. It will give you extra prep space and provides a place to stash all those extra tools you want nearby. 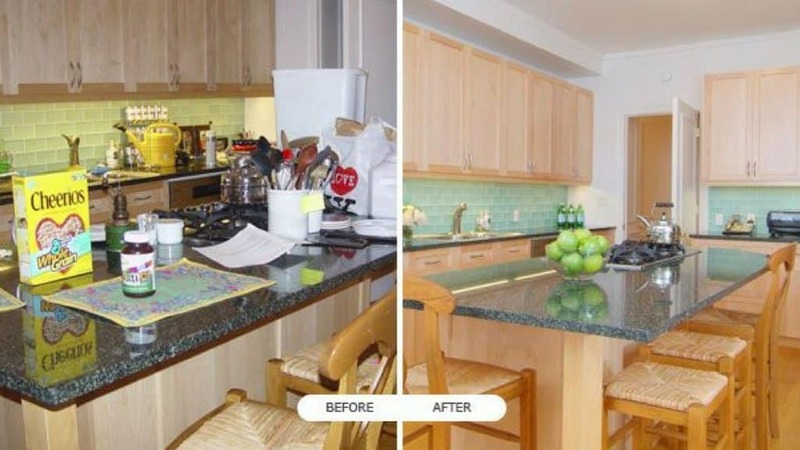 Of course, a kitchen remodel is the perfect time to declutter your countertops because you’re having them replaced! But unless you make a vow to stay on top of it, the clutter will slowly and surely make its way back into your family’s life. Probably the best thing you can do to keep your counters spotless is to develop a daily habit of picking up anything that doesn’t belong there and returning it to its rightful spot before you turn in for the night. In the morning you’ll wake up to neat and tidy space that sets the right tone for the rest of the day. As you get started on your decluttering quest, remember that slow and steady wins the race. It may take some time to get it all under control, but every step you take and result you see will encourage you towards the finish line. At McManus Kitchen & Bath, we love showing our clients the wide variety of countertops available for their new kitchen. To discover more about choosing the best ones for your remodel – and for more tips on keeping everything neatly in its place – contact us today to schedule a visit to our showroom. We look forward to meeting with you!